Wow…it’s been a great couple of weeks for analysis and reporting in Tradervue. 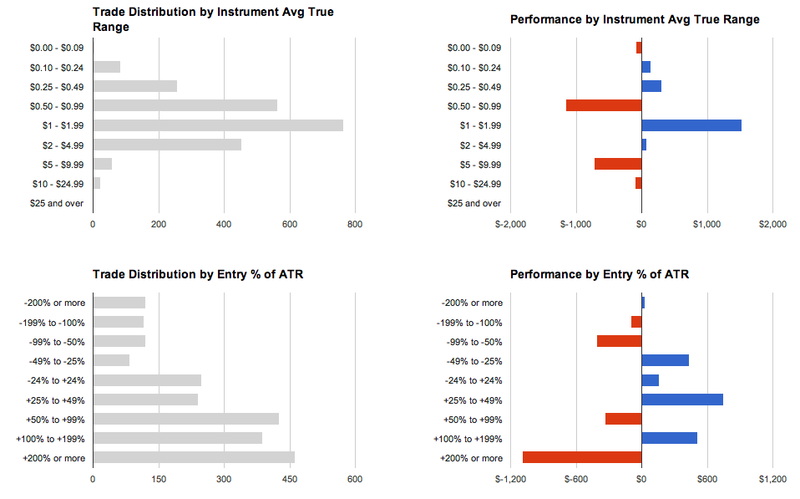 On the heels of the new MFE/MAE calculations from last week, we’ve now added 8 new reports (16 if you also count the distribution charts) for analyzing performance based on what your stock or future was doing. These are useful for everyone, but especially useful for equity traders, who may be trading a number of instruments based on news or order flow. Click on that, and you’ll see the old performance by symbol reports at the top (these were previously in the Instrument/Price/Volume group), but then a bunch of new reports! 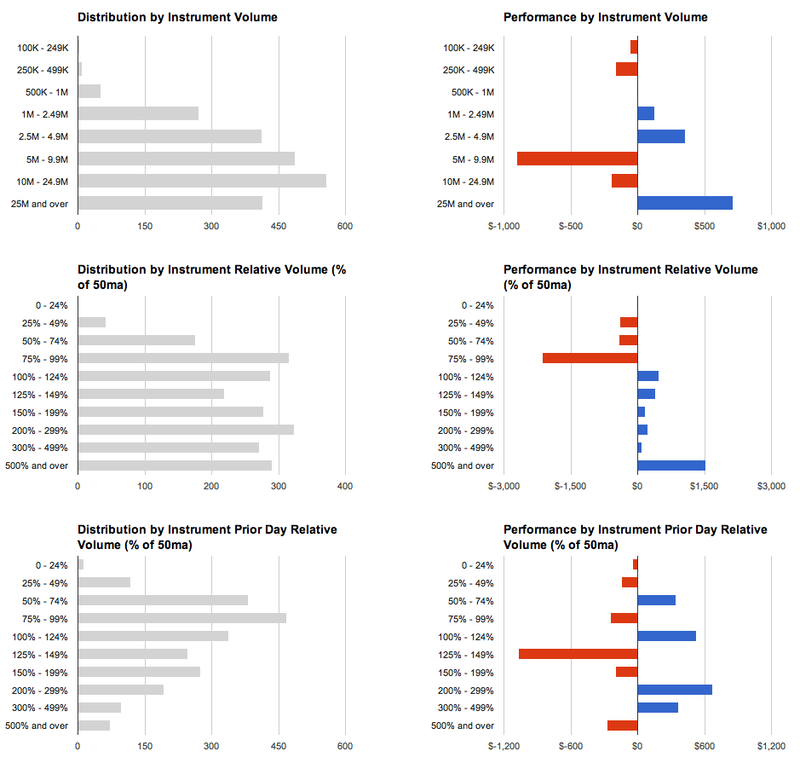 Distribution/Performance by Instrument relative volume – shows your performance plotted against the relative volume traded on the day. Specifically, this is the volume with respect to the 50-day moving average of volume. Helps you understand your performance on days with unusually high volume, for example. 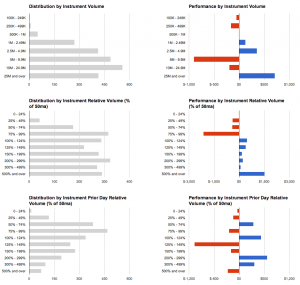 Distribution/Performance by Instrument Prior day relative volume – shows your performance plotted against the relative volume traded on the day before the trade. Specifically, this is the volume with respect to the 50-day moving average of volume. Helps you understand your performance on follow-through days, for example. Distribution/Performance by Instrument movement – shows your performance against the total move of the instrument on the day. 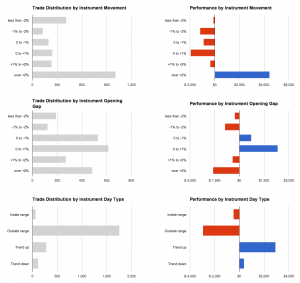 Distribution/Performance by Instrument opening gap – shows your performance against the opening gap of the instrument on the day. If you’re typically trading on news, and watching for large opening gaps, this can give you some insight into whether that’s working for you. 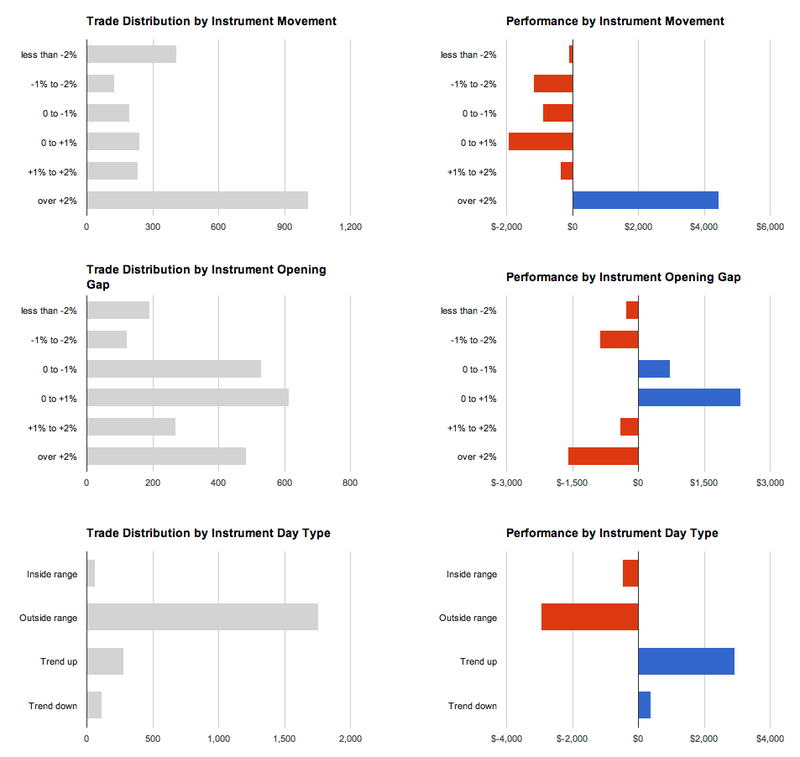 Distribution/Performance by Instrument day type – shows your performance plotted against the day type of the particular instrument you’re trading. Are you successfully capturing the move on days when your particular stock is trending? This will help you understand that. 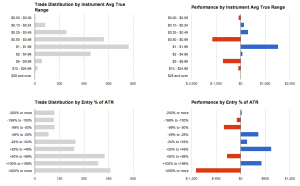 Distribution/Performance by Instrument ATR – shows your performance against the ATR(14) of the instruments traded. Distribution/Performance by Entry % of ATR – shows your performance against how much of the ATR was already “used” on the day. For example, if you’re entering trades after they’ve already moved 2x their ATR, this will show you details about that. Whew! That’s a big update. The distribution/performance by instrument volume reports are available for all users, and the other new reports are available to all users with a silver or gold subscription. Give them a try today! This entry was posted in Announcements and tagged analysis, atr, reports, volume by gregr. Bookmark the permalink.